In the past few years, crepes have been popping up in every restaurant and cafe in my town. I always assumed that they were these super tough, finicky brunch item that would be tough to make so I had never tried to make them myself. After having a craving for them and not feeling like wrangling up the kids to go to a restaurant, I finally started looking into making them myself and couldn’t not believe how EASY they are to make. Aside from being super easy to make, they are so versatile and can be filled with all sorts of delicious fillings that range from sweet to savory. Similar to a super thin pancake, crepes are made from basic ingredients that you most likely already have in the house. They can even be made ahead of time and reheated (or even freeze them for later use). The only ingredients needed for crepes are flour, eggs, milk, water, butter and salt. So simple! 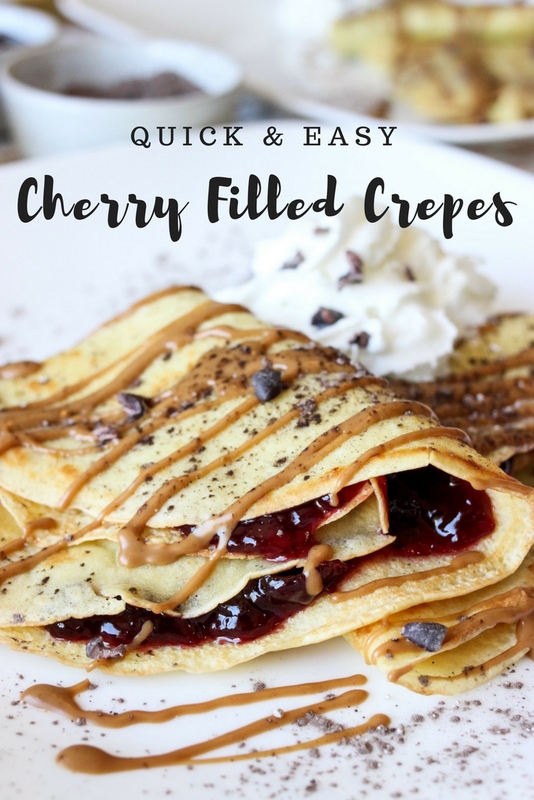 Today I’m sharing one of our favorite quick to prep crepe recipes that will have everyone smiling on happy for a quick weekend brunch: Cherry-filled crepes! 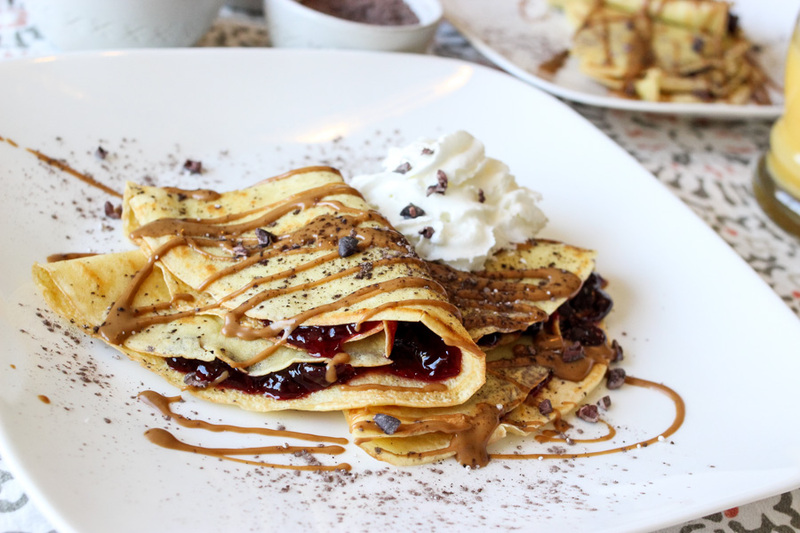 These delicious crepes are filled with cherry preserves, drizzled with a sweet cookie butter or chocolate hazelnut, dusted with powdered sugar and a dollop of whipped cream. YUM! I was inspired to share this recipe due to Eggland’s Best 2018 “America’s Best Recipe” Contest! Eggland’s Best America Best Recipe contest invites fans to submit recipes inspired by their local hometown or states favorite ingredients or dishes for the chance to win $10,000! Each recipe must include at least two whole Eggland’s Best eggs and should be submitted by April 30, 2018. Each participant can enter up to two recipes per category (breakfast/brunch, appetizer, main course, dessert) for up to eight chances to win! Since Michigan Cherries are so well known, I wanted to make a recipe that included their tart deliciousness! 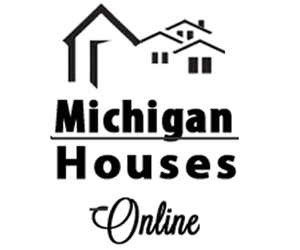 To learn more or to enter the contest, click HERE. These easy and delicious crepes can be made in just minutes. Made with simple ingredients that are likely in your pantry, makes this a great breakfast or brunch option to make quickly. Preheat griddle/pan to medium high heat (350 to 375 degrees). Oil well. Mix together flour and salt and stir well. Whisk eggs in separate bowl. Slowly mix in water and milk to flour mixture. Add beaten eggs and butter and mix very well. Add 1/3 cup of batter to griddle and tilt the pan in a circular motion to spread batter thin and well. Cook for ~2 minutes of each side until lightly browned. 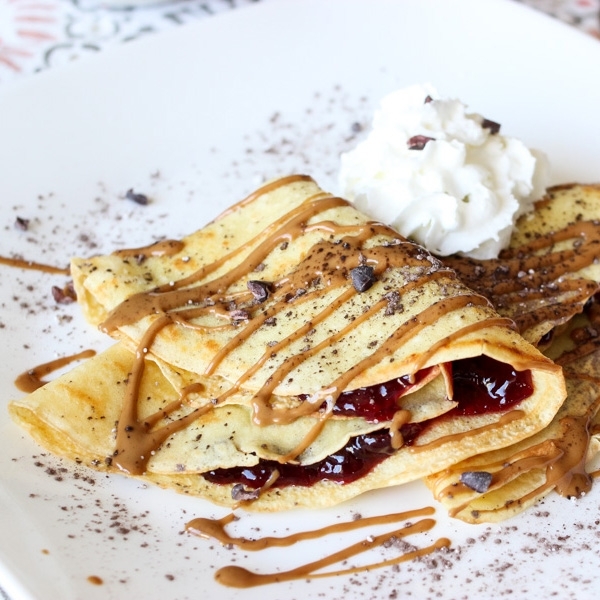 Fill crepes with cherry preserves and top with fillings of choice. Serve warm. 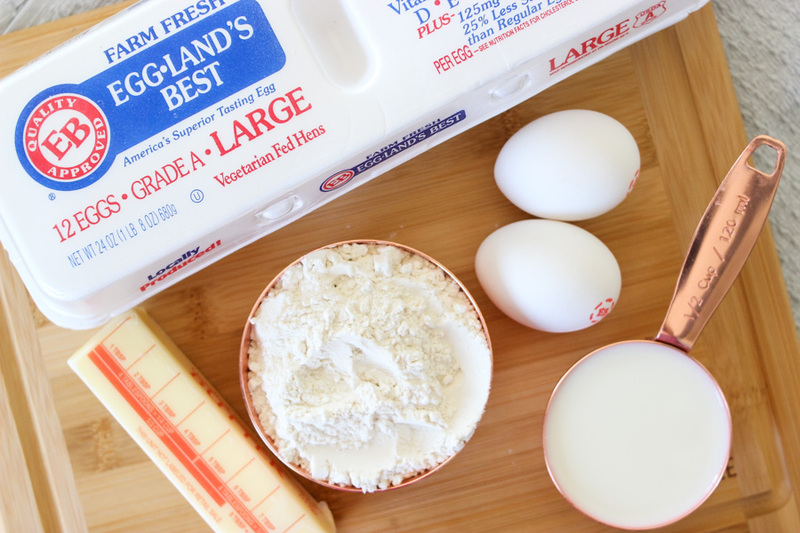 When it comes to cooking, I always reach for Eggland’s Best Eggs! Eggland’s Best is the No. 1 branded egg in the U.S. and is an excellent source of vitamins D, B12, E, B5 and riboflavin. Eggs are a favorite food in our house since they are packed with so many powerful and important nutrients! Eggland’s Best eggs have six times more vitamin D, more than double the omega-3s, 10 times more vitamin E and 25% less saturated fat than ordinary eggs as well! To learn more about their Eggland’s Best eggs and their amazing nutrition, go here! Don’t forget to enter your favorite egg recipe for your chance to win $$$! I can’t wait to see all the different regionally inspired recipes and get cooking! Enter here! To entice you to get cooking, Eggland’s Best is offering one of my followers a $25 virtual Visa gift card, one (1) coupon valid for a free dozen Eggland’s Best eggs, and one (1) coupon valid for a free pouch of Eggland’s Best Hard-Cooked Peeled Eggs! To enter simply comment below with your favorite crepe filling or your favorite egg recipe! What’s your favorite filling for crepes? 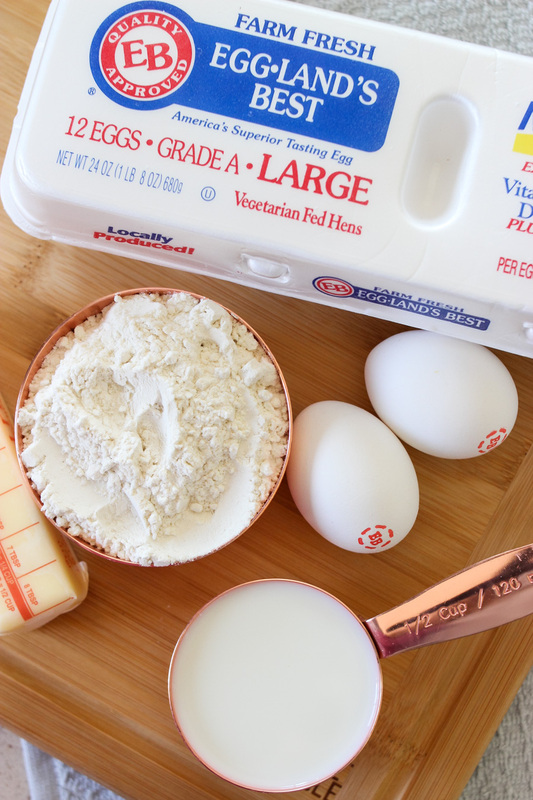 What’s your favorite recipe that uses eggs? I LOVE your photos in this post! Also, I always thought crepes were just too hard for me to do, but now after reading your post, I am encouraged to try it! These look amazing. And I totally thought these were hard to make too! Unlike you, I never bothered to look up and so I’m glad I came across your post!! Who knew these were so easy to make!! my favorite egg recipe is broccoli and cheddar cheese quiche. My favorite would be blueberry and creme. 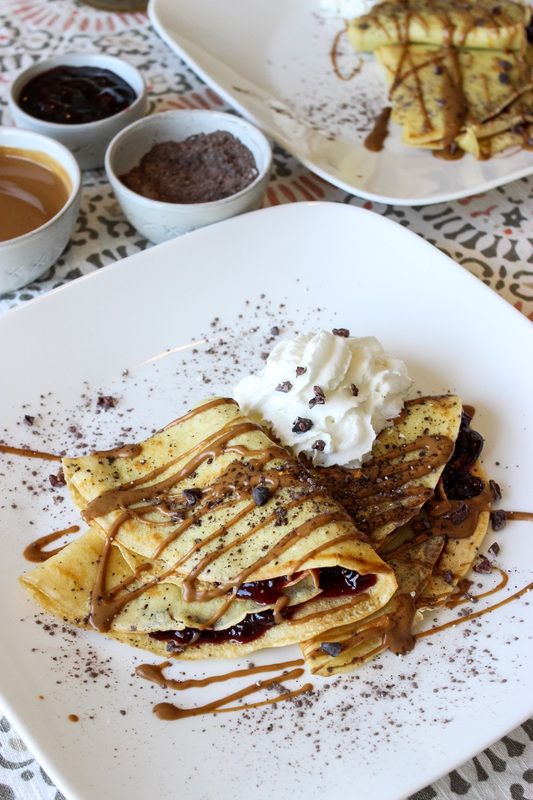 Nutella is Wonderful inside crepes! My favorite crepe filling is creamy strawberry with bananas. Oh so good! My favorite crepe filling is apples or peach – sweet not savory for me. My favorite is a ham/cheese/mushroom omelette. My favorite crepes are plain with a lemon glaze drizzle!! My favorite egg based recipe is a ham and asparagus fritata. YUM!! Crepes are my favorite! I recently found this awesome crepe place locally and I’m addicted but never knew they were so easy to make at home! Now that I do I will for sure be trying them. These look amazing! Great giveaway too. Wow – those look delicious, Amber!! I prefer cinnamon apples or tart cherry filling in my crepes! I love deviled eggs and veggie omlets with goat cheese! Yum! My family loves it when I substitute with Nutella! sugar and cocoa powder. Next, I just place some inside the crepe fold over and put a little on top with some nicely shredded chocolate curls and even sometimes I additionally add banana slices or pitted cherry halves. Yummy! This looks so delicious! I’ve never tried crepes, but I’m definitely trying this! My favorite filling is peaches and cream. I like a good egg salad. I love crepes with peaches! My favorite crepe filling is lingonberry jam! I love strawberry filled crepes toped with fresh, homemade whipped cream. 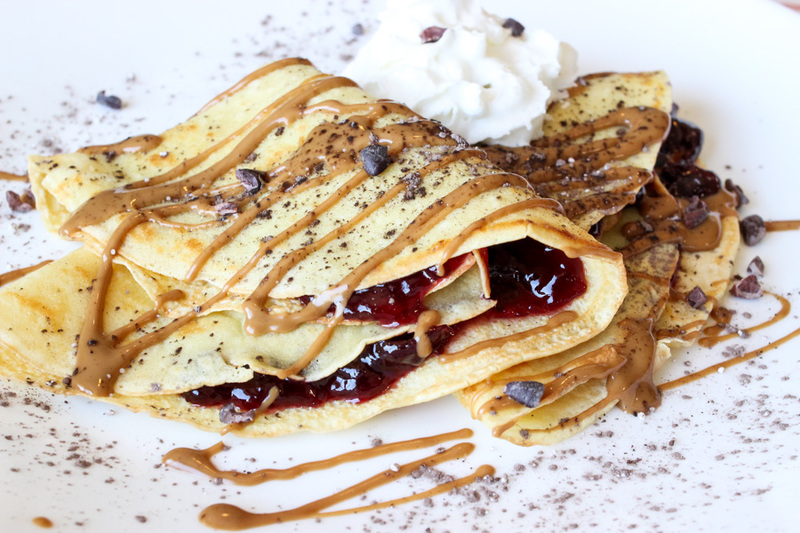 There’s a crepes place in Royal Oak that does crepes with Nutella … yum. My favorite egg recipe is “eggs Florentine.” I make it every other day for my family and they love it! My favorite egg recipe is a cream cheese, salmon and scrambled egg burrito. My favorite thing to make using eggs is egg burritos. We usually eat them for dinner instead of breakfast because of how long they take to prepare. I like savory crepes like chicken or spinach. I’ve never had crepes but would love to try them! These look delicious! My favorite egg recipe is veggie omelets. I like crepes with cinnamon apples. My favorite way to use eggs is in cobb salad. I love savoury crepes, with mushrooms, spinach and parmesan! My favorite is onion corn quiche. I love strawberries is my fave crepe filling. I like blackberries in my crepe. My favorite filling for crepes is Nutella and strawberries. My first choice is Cherry, followed in a close second with Blueberry. Peanut butter and honey is my fave filling! My favorite crepe filling is a cream cheese filling and then cherries on top. I love nutella and strawberries. My favorite crepe filling is cream cheese and strawberries! I love banana and peanut butter filling! I love strawberry filling! And my favorite egg based recipe is spinach quiche! My favorite filling is definitely strawberries and bananas with a drizzle of caramel on the top. Yum! My favorite recipe with eggs is a Denver omelet. Yum! My favorite filling for crepes is blueberries. My favorite recipe that uses eggs is my hubby’s famous omelet- ham, egg, bacon and cheese! I’ve never made crepe, although I wouldn’t mind eating some right now 🙂 Thank you for the recipe! Yum. I LOVE crepes. They are one of my guilty pleasures. I have only made my own a couple of times, I’ll have to try your recipe. They look wonderful. Oh those look so good! Cherry anything is one of our families favorites! I would also love to try a strawberry filling!!!! I haven’t tried making crepes before but this looks like a really good one to try and I also saw a recipe for a savory version with a mushroom filling that looked yummy too.